Mother's day is just around the corner, normally we buy a card and a nice little gift. 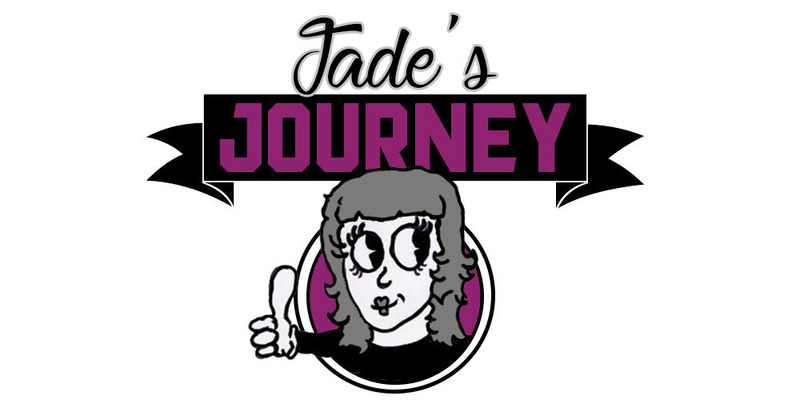 However this month is really expensive for us our car needs to go to the garage and the tax is due, I have my works leaving night out plus Jared has three parties to go to and my sister has a birthday. So I got thinking about what we could do rather then a meal or shop bought gifts, we made some great things today for one Nanna. This week we will make more one for Nanny and one for great Grandma. As you may have noticed I love pinterest, which is what inspired our makes today. The first thing we made was a card. 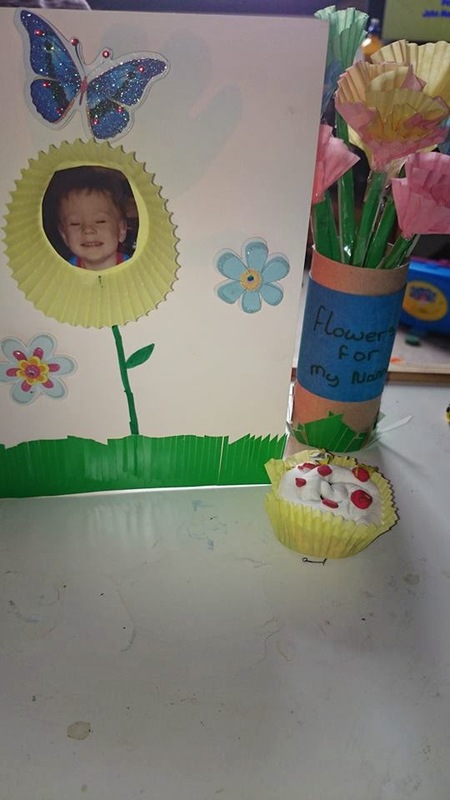 All of our makes today used cake cases the pack of 50 was bought for 50p and we used paints and coloured card and paper that we have in our craft box. The outside of the card we drew a flower stem with a cake case as the flower head with a photo of Jared glued inside the case. I then stuck some green card along the bottom which I cut to make it look like grass. We have lots of 3D stickers, Jared picked a few and stuck them on the card. 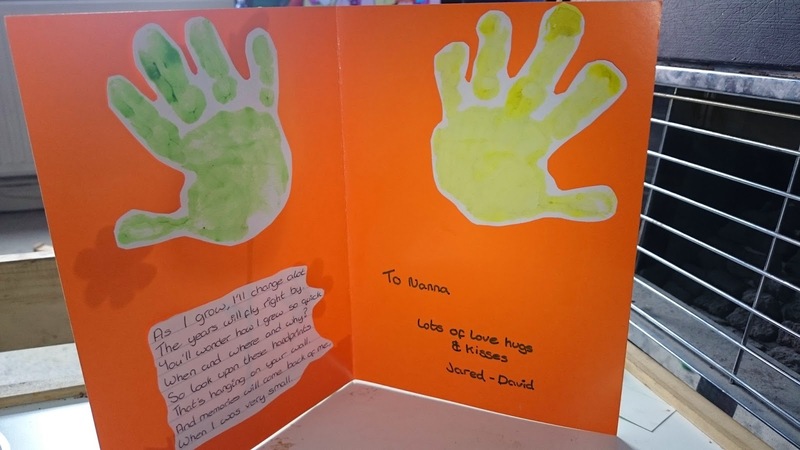 The inside of the card we made hand-prints, letting Jared choose the colours. I cut around the hand-prints and stuck them on the inside along with a short poem that I found. It was simple to make and something that nanna can cherish forever along with the thousand pictures that he draws for her. The next thing we made was a little bit more tricky and Jared found these hard to make but for older children I think they would love to make them. I got one of the cake cases, made a fist with a circle with my thumb and finger. I placed the case over the circle then pushed it threw the hole and twisted the end these made cute little flower heads I held the twisted part together with tape although I now wish I had used loom bands as I'm sure it would of been quicker. 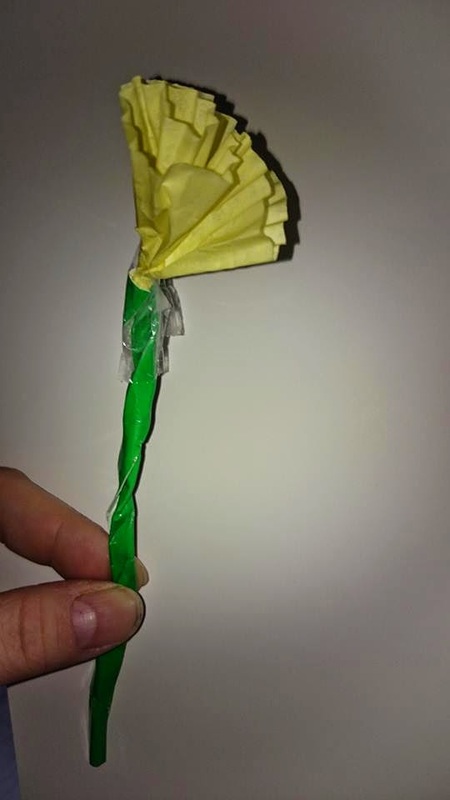 I then made stems from green card by rolling them sticking them with tape and then taping the flower heads on. 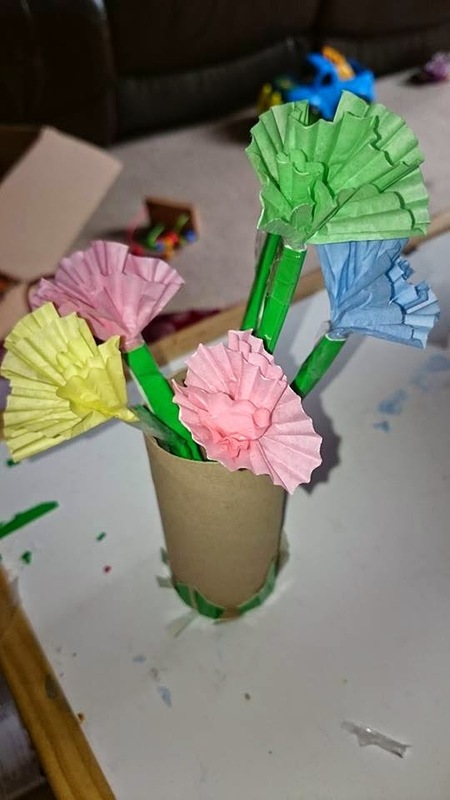 We used a toilet roll to make a vase for the flowers and did a bit of decoration on it (Jared got a bit excited and crushed the first vase so I made another). Nanna always makes beautiful cakes. So beautiful we never want to eat them but we know how tasty they are. 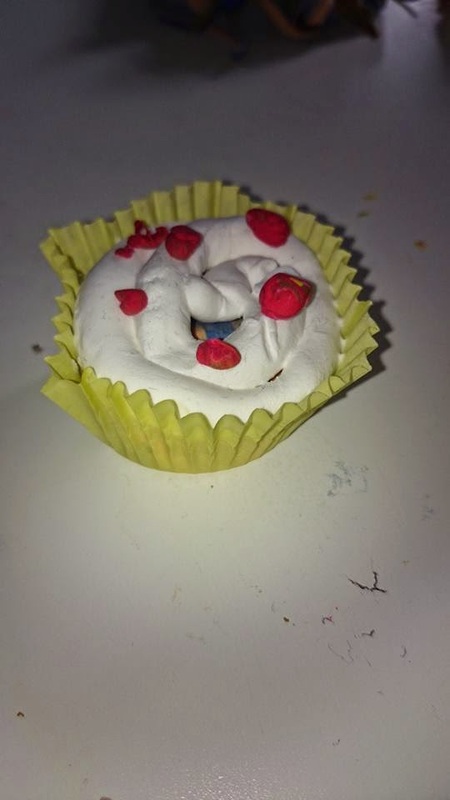 We used some foam like clay to make nanna a cupcake that no one can eat. 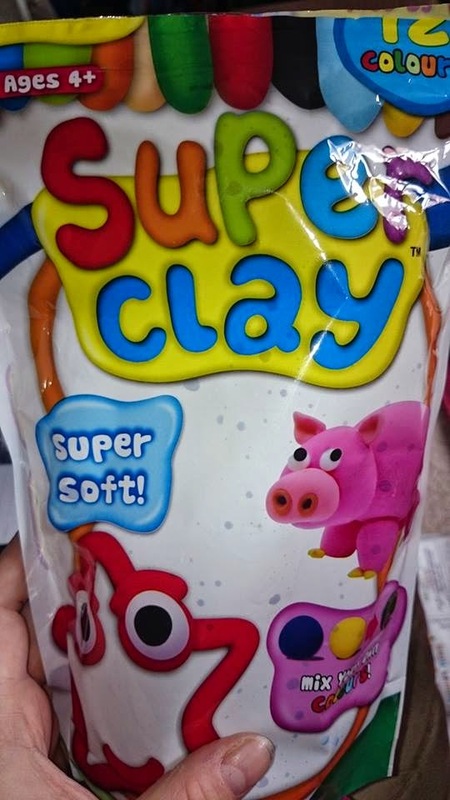 The clay is about £3 I bought it from Home Bargains a while ago. Like any young child Jared mixes the colours but we found a few bits that were the same colour and used that to make some white icing and then we made little red sprinkles to dot on top. I also made a bee from the clay as I'm a big kid and loving playing with it. The collection of things we made today didn't cost much and we had such good fun making them. Jared really loves it when we sit down and do some crafts and I love spending the time with him without peppa pig interrupting us. I will be adding more posts about the other crafts we make for the other grandparents. If you have any idea's then please leave us a comment we read all of them.